We're ready to take care of all your Idaho real estate needs. We've got realtors from Island Park to Shelley ready to help you find the perfect home or sell the home you've got. We also know real estate investment and can help with your 1031 exchange or rental property search. So go ahead. Use our site. Today, anyone that wants to buy or sell real estate in Idaho can sit at their computer in pajamas and slippers and sip on a fresh cup of steaming hot cocoa as they anonymously journey through neighborhoods and sneak a peek into thousands of homes... completely undetected. Have fun. And when you're ready to move.forward, give us a call and we'll make it happen! The easiest way to buy, sell, or rent... profitably. Searching for property has become so easy, you can find almost anything with just a few clicks. And the benefits aren't limited to buyers. Sellers have the power to look at hundreds of homes near them and determine how their home will stand up to the competition on quality, price, and amenities. Technology has handed homeowners and potential home buyers a magic wand. With all the wonderful tools out there, you have to ask, "why would anyone need to get help with Idaho real estate from an agent?" You probably already know, based on your instinct alone. But let me explain. Simply put, we know where the buyers are and we know how to get them to your home quickly. Our agents are working with buyers every day. They show thousands of homes which means they know the neighborhoods, the schools, and the homes they show. When you market your home with us, we immediately begin to match up our buyers with your home to find the right fit. We also provide this fast, comprehensive website, as a free tool to buyers throughout East Idaho. We are marketers that are also real estate agents. Our roots are in marketing and selling, so listing a home with us puts your home in front of tens of thousands of people in Idaho, the west, and the world. When you have more buyers looking at a property, the result is homes selling for the best market price possible. Don't settle for less by missing the power of marketing your home. As wonderful as technology is, and as important as it has become to real estate, technology has two major disadvantages that can only be overcome by a real estate agent. The disadvantages are lack of human touch and zero professional experience in managing transactions that sometimes have hundreds of variables that cannot easily be quantified. The simple fact is real estate transactions are too complicated and include too many people and institutions to be managed by someone that may only buy or sell a few times in their life. Nor do most people want to do all that is required. On the other hand, real estate agents love it, and train and learn to develop professional level abilities in technology, sales, marketing, legal contracts, task management, counseling, and problem resolution to provide the best value and service to their clients. We're like your mom, only for real estate! OK, probably not your mom!. 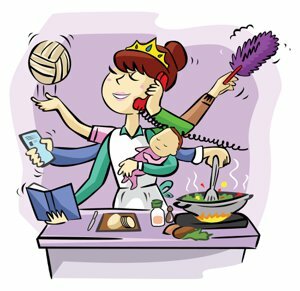 Mom's do a lot of things at the same time and get a ton done every day, but we really do work hard for you. Preparing to be a great real estate agent begins with a lot of classes and tests to pass the Idaho Real Estate commission license exam. Lots and lots of hours in class and studying. Once licensed, we are also required to take hours of continuing education classes to make sure that we are up-to-date on the latest stuff like Idaho real estate law, ethics, responsibility to clients, marketing and more. But there is more. We are also Realtors. Realtors must participate in professional standards training and additional ethics classes in addition to the state license requirements. Kinda makes you tired! Once we are done with our state and Realtor training, then the fun begins. We do our very best to provide our clients with awesomeness. To accomplish this, we spend hours learning things that are important to our client's success, like how to market a home successfully, and how to find and negotiate the best home purchase for our buyers. We learn to take great pictures or work with the best photographers. We even learn to fly drones. Yep, drones. Whodatunk! We learn to use multiple listing services, real estate syndication services, Zillow, Realtor.com and many other places where we can showcase your property. We do all of this to get properties under contract. Once a property is under contract, we do something called contract-to-close management. Think of it this way. The minute you and the other party in your transaction sign a contract, the clock starts ticking toward a closing date when the property actually transfers ownership. A lot of stuff happens while the clock is ticking. Some of it is really important, meaning that if you miss doing things by certain dates, it could actually cost you money. We watch these dates very carefully, make sure that things like inspections and notices are competed on time, and work with the other party's agent to make sure they are taking care of their responsibilities. We also order and manage things like title research to make sure that nobody has placed a lien on the property being sold. That is a bad thing! We also work with a lot of people. During a transaction there are many people involved. A few of these are the buyer or seller and their agent, loan officers, lenders, underwriters, title agents, escrow officers, brokers, photographers, utility companies, insurance agents and the list goes on. Can you believe we actually like doing this? Well, we do. And because we love it, we take the time to learn it and do it well...all for you. Ready to buy a home? Lets talk early. There are a few things you will need to do before you actually find your dream home that will make things go way easier. One of them has to do with your lender. Another way to get help is to create an account on this website and start looking at real estate. 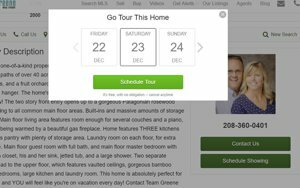 When you find a home for sale that interests you, you can either call us on the phone at 208-360-0401 or you can click on the "schedule appointment" button on the property detail page. There you can choose a date and schedule a tour. Also, don't forget to favorite the property. This will help your agent when they are looking for other similar properties. This is especially important because there are some properties that don't even make it to the MLS. If you are ready to sell your house, there are a few things that we need to get done right away. First, we need to do a professional comparative market analysis on your home. If you want a quick and generalized evaluation, use our home value report tool. But if you want a much more detailed analysis created by one of our experienced agents, call and ask for one today at 208-360-0401. We will create a report and deliver right to your door. Check with all of your utilities to make sure you are up to date on your payments. Getting help on your next real estate transaction is easy at Team Greene Real Estate. Pick up the phone, make the call, and lets move you forward today. It's time. Ideal land for logistics and distribution, or a corporate campus development located in a regional industrial hub near the I-15 interchange to 65th S street.